Last week we visited Malibu, but for our next foray to the coast, we’re going all the way down to South Bay to check out the Palos Verdes peninsula and the fabled city that never was -- because it nearly slid right into the sea! About ten million years ago there was a volcano in San Pedro. 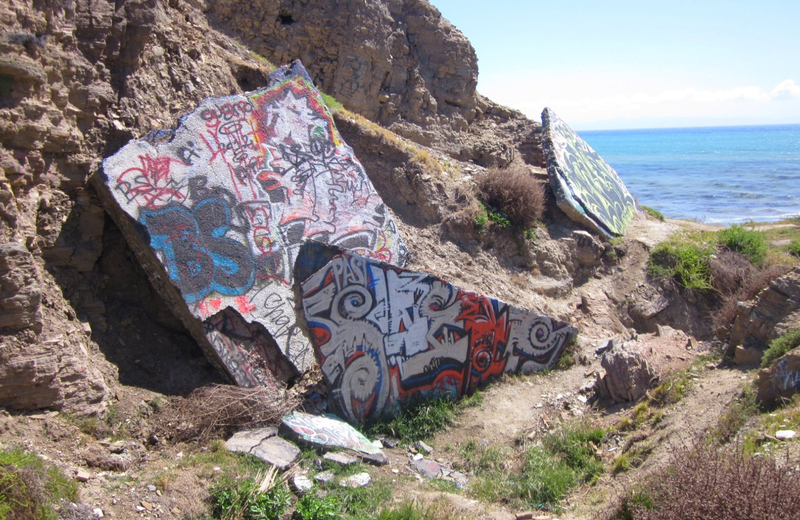 Now it’s just 6 acres of broken concrete and graffiti overlooking the ocean. The so-called Sunken City began as the poorly conceived location of a hotel and beach bungalows in the early 1900s. However, this community slowly began to separate from the rest of Point Fermin Park in 1929, and eventually it sank a whole 40 feet – nearly disappearing into the sea. Fortunately, the residents had already dispersed and the buildings had been destroyed, but it wasn’t until the 80s that the ruins were completely fenced off. Lately, locals have campaigned to turn the site into a public park, which would need to gain more support from the city to become a reality. Until then, adventurous teens and taggers alike just hop the fence and poke around on their own. Danger is afoot, of course, so we don’t encourage it, but we’ve heard it’s pretty exciting. Kind of like something out of The Lost Boys... Don’t be scared, Michael. If you do make the trip, don’t miss the Korean Friendship Bell, just up the S. Gaffey Street hill at Angel’s Gate Park. This massive bronze bell, which is housed in an elaborately painted pavilion overlooking the ocean, was presented as a gift to the U.S. by Korea in the 70s. Gamsa!